Rolex loves to celebrate big on anniversary models, particularly of their tool watches. And so they should be. They boast an enviable range of tool watches that were indeed groundbreaking during their debuts. What’s more, these iconic Rolex watches continue to lead and shape the luxury watch space today. Here we take a look at some of our favorite Rolex anniversary models, including the Submariner, GMT-Master II, and Daytona. In 1953, Rolex caused some serious waves with the introduction of their now-famous diving watch—the Submariner. Due to its watertight Oyster case, it was the first diver’s watch waterproof to a depth 330 feet (100 meters). After its launch, the Submariner quickly became the go-to dive watch for underwater explorers everywhere. Rather than the luxury watch is has become today, the first few generations of Rolex Submariners were indispensable instruments that were used to complete a job. While the Submariner today is still very much a diver’s watch, it’s a luxury sports watch rather than just a utilitarian device. 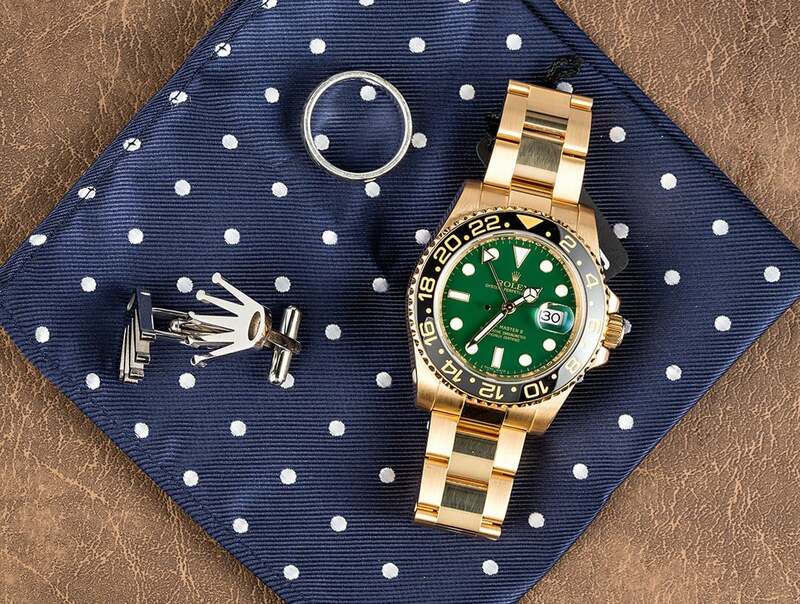 In 2004, Rolex introduced the Submariner ref. 16610LV to mark the model’s 50th anniversary. The commemorative Submariner shared many of the same design traits as the traditional ref. 11610. It sports the same steel 40mm Oyster case with the Triplock crown and water resistance to 1,000 feet (300 meters). It also wears the same stainless steel Oyster bracelet that extends to fit over a diving suit. Additionally, the ref. 16610LV also houses the Rolex Caliber 3135 automatic movement. The differences between the classic ref. 11610 and the anniversary ref. 11610LV are found on the face of the watch. 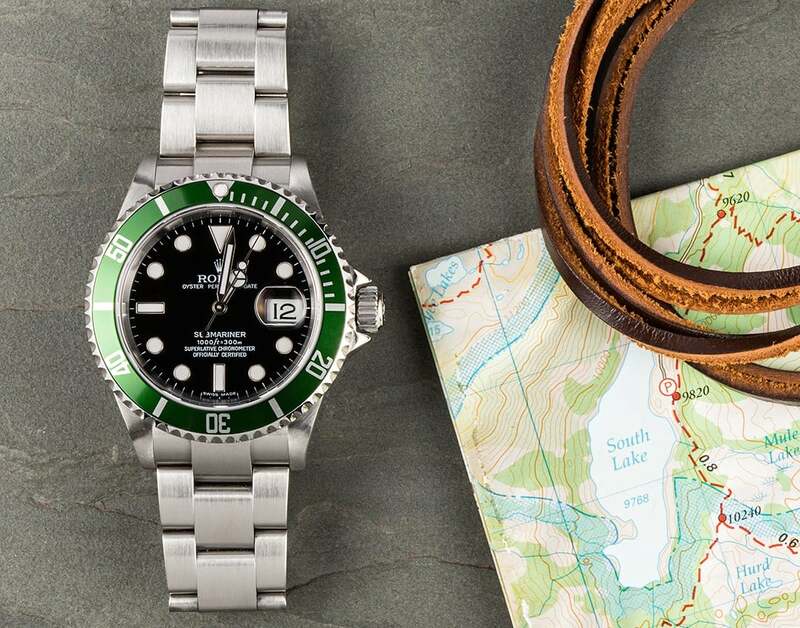 First and foremost, the anniversary Submariner has a vibrant green bezel insert. This choice in color for the unidirectional rotating bezel has brought about the watch’s nickname—the Kermit. The green ref. 11610LV was also the first Submariner to include the Maxi dial whose large lume plots are framed with gold surrounds. Although the Submariner ref. 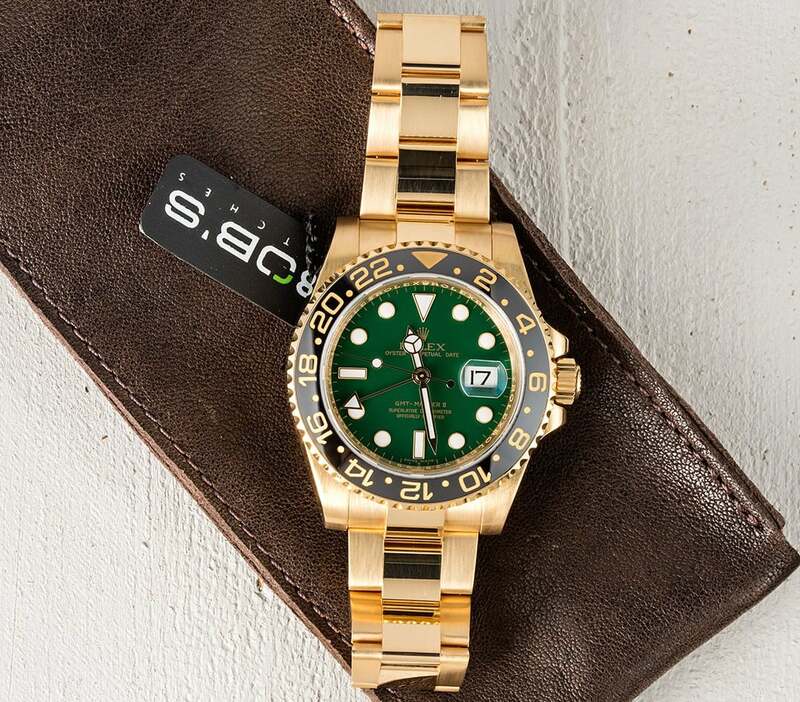 16610LV is no longer in production—it was replaced by the also green Submariner ref. 116610LV in 2010—it remains a popular model today. The very first Rolex GMT-Master dates back to 1955. Again, this model was a tool watch, but this time for pilots rather than divers. The GMT-Master was originally conceived for commercial Pan Am pilots as a way to keep track of two simultaneous time zones while they flew from city to city. This was possible because of the GMT-Master’s extra 24-hand in addition to the rotating 24-hour bezel. The bezel has become the most important design characteristic of the GMT-Master, even gaining its own nicknames—Pepsi, Coke, Root-Beer, Batman—depending on the particular color scheme. 50 years later in 2005, Rolex unveiled the anniversary GMT-Master II ref. 116718LN to mark the half-century milestone of the watch’s history. And again, it was fitting that the bezel on the commemorative GMT-Master made headlines. The ref. 116718LN was the very first Rolex to include the Cerachrom ceramic bezel. The use of ceramic on Rolex bezels is prized for its look, its resistance to scratching, and its immunity to fading. Aside from the new ceramic bezel, the yellow gold GMT-Master II ref. 116718LN was a completely resigned version of the famed Rolex pilot watch. It had a Triplock winding crown rather than the previous Twinlock one. Furthermore, its rich green dial was the Maxi Dial version with larger luminescent round hour markers. Also, its 18k yellow gold 40mm case wore bigger thanks to its increased thickness and bulkier redesign and the bracelet of the ref. 116718LN now had polished center links and the Easylink system for length adjustments. The anniversary GMT-Master II also had the new Rolex Caliber 3186 automatic movement. The GMT-Master II is still currently part of the Rolex lineup and it is a wonderfully luxurious version of the legendary pilot’s watch. 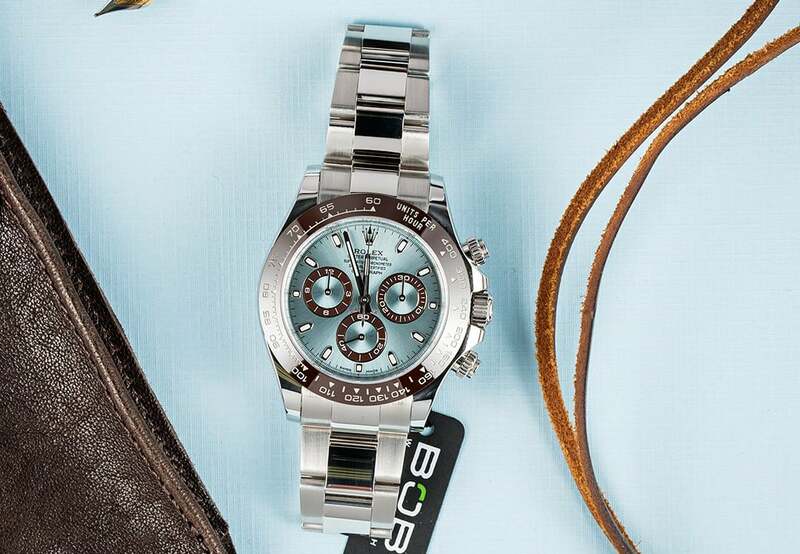 First launched in 1963, the Daytona is Rolex’s chronograph collection inspired by motor sports. The Daytona has had an incredible history thus far, particularly as the indisputable king of vintage sports watches. Very few watches come even close to garnering the amount of excitement a vintage Daytona does—especially the vintage Paul Newman Daytona models. Over the course of its 50+ years, the Daytona has undergone several improvements and modifications, most notably with its movement. First using modified manual Valjoux movements, then moving on to automatic Zenith ones, today the Rolex Daytona is driven by the manufacture’s own in-house automatic movements. In 2013, for the 50th anniversary of their flagship chronograph, Rolex presented the platinum Daytona ref. 116506. In fact, this is the first Daytona to ever to use platinum. While this actually upset many Rolex fans as they were looking forward to a steel model as the anniversary edition, the choice of ultra precious platinum highlights the ref. 115506 as a very special model indeed. The platinum 40mm case features a brown Cerachrom ceramic bezel, which matches the trio of brown subdials on the dial. The dial sports an ice blue shade, a color Rolex reserves only for its platinum models. All these design elements come together for one grand statement watch worthy of the big Daytona birthday.